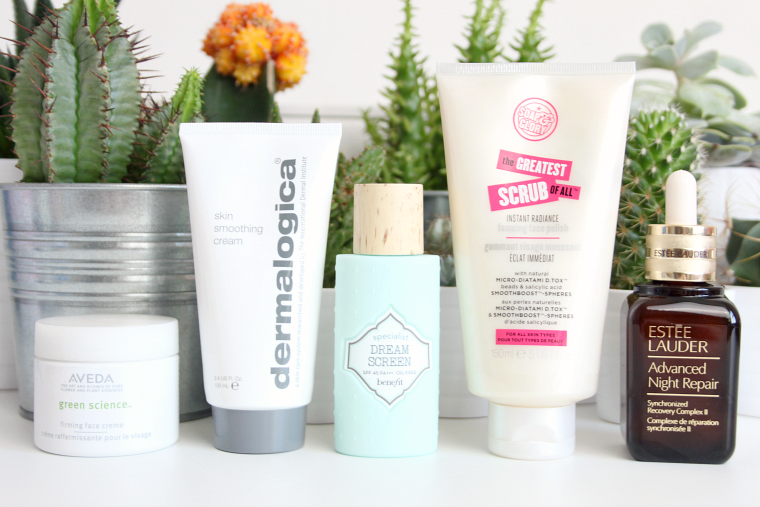 Three weeks after my first skincare sunday post and I'm back with another, yes, I've even surprised myself in managing to keep fairly consistent for once. I've been addicted to trying out new skincare products as of late, and have found some real gems as a result. I've tried out plenty of day creams but have never tried anything as lightweight yet affective as Aveda Green Science (£45). This has been part of my daily morning routine for the past month or so now and it's soon become one of my all time favourites. I have typically dry skin so prefer a moisturiser that is hydrating yet doesn't coat my skin too much so that my layer of foundation can sink in properly, usually I've found that you can't have best of both worlds but this little pot delivers everything I'd want from a day cream. The same can all be said for Dermalogica Skin Smoothing Cream (£40), which is similar in the way it works but is slightly thicker and is what I go for on days where my skin needs that little bit extra loving. With the weather starting to warm up it's super important to make sure you're dosed up with a good level of SPF. Benefit Dream Screen (£25) is perfectly lightweight and applies like a dream. I've also been getting my scrub on with Soap & Glory The Greatest Scrub of All (£6) which I use in the shower every couple of days and always reveals bright and radiant looking skin. My favourite product of all lately has most definitely been Estée Lauder Advanced Night Repair (£69), seriously, why have I only just got round to trying this stuff out. I've known about it for years and years due to it's holy grail product status and rave reviews. I've now been using it for a fair few weeks each night and have noticed a big difference in the overall brightness of my complexion. I've even noticed that I haven't been wearing as much foundation as I have that natural looking glow to start with. I know it's on the pricey side, but if you are to invest into one special skincare product then make it this. Totally get your love for ANRII :) It's a beautiful product and I use it most nights! Great products you have here. I am eyeing on trying out that Estée Lauder Advanced Night Repair. I have heard so much about it and reading your views about it made me really convinced of giving it a go. Great products! Im trying out so many products of late to find the perfect skin care routine for myself and this post has given me some more inspo, so thanks!